In a City for All, regardless of race, gender, ability, religion and gender identity, everyone has opportunities to succeed. · People who are Indigenous, immigrants, racialized, living with disabilities and trans are more likely to be unemployed, with lower salaries and less opportunities for advancement. · In comparison to men, women are more likely to have higher rates of unemployment, over-representation in part-time jobs and higher rates of poverty. On average women earn 87 cents to the dollar earned by men. 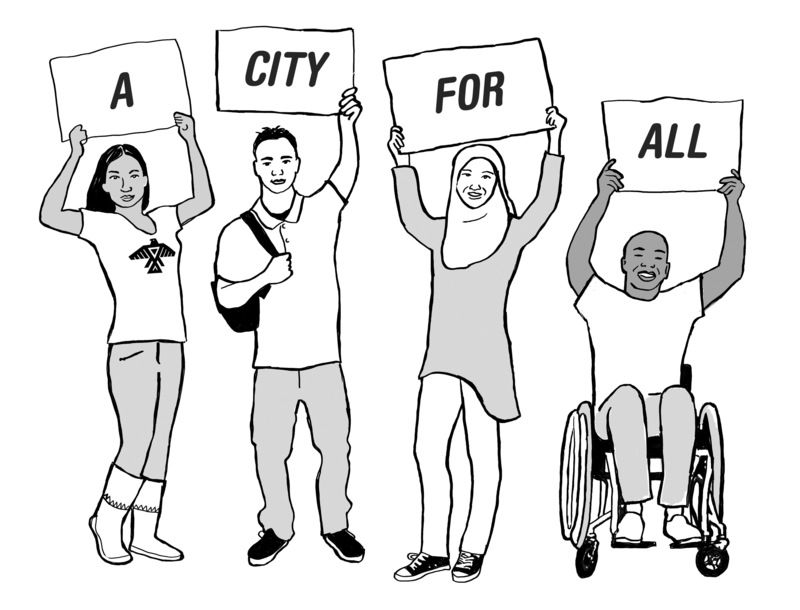 · In a City for All, regardless of race, gender, ability, religion and gender identity, everyone has opportunities to succeed. · In order to have City staff and managers, that are representative of Ottawa’s population, will you increase hiring and advancement of people from equity seeking groups including Indigenous people, women, racialized people, LGBTQ, people with disabilities and newcomers? · City Council has voted to study the creation of a Women’s Bureau in the City. Will you support the creation of a Women’s Bureau to ensure gender differences are taken into account in city decision making?